Another 15 wins & 46 nominations. A strangely disappointing experience given the quality credentials of just about all involved. The relative inexperience of the writers is clearly evident. Whether seen as a metaphor for a world without God (hell), or the Nazi regime, the cultural and social landscape of Narnia is ripe with potential, none of which is realized here. The White Witch's regime is not explored, we are not told who she is, where she came from, how or why she took over the world. She lacks any motivation or real emotional drive. Similarly, the children seem happy to throw themselves into a war without a second thought of home. Nothing in this story is ever explained, we are simply expected to accept it without question, which is a far more dictatorial representation of Christianity than Lewis ever intended. The plotting lacks energy and momentum, with no real sense of suspense. The characterization is weak and one-dimensional. But even more surprisingly from the creators of Shrek, is the complete lack of humor. The acting is sound from all but the leads. The two older children struggle to bring the necessary range of emotion to their roles, with Moseley in particular presenting a decidedly weak interpretation of heroic kingliness. The two younger children luckily make up for their on screen siblings' shortcomings, with Henley bringing the wide-eyed innocence to Lucy that the role requires, and Keynes displaying a surprising amount of subtlety as the eternally wronged and resentful Edmund. McAvoy and Swinton are both excellent and at times are required to carry the movie alone. The CGI is competent, but little more. It's always good to see Fauns and Centaurs running around, but it doesn't break any boundaries in terms of design or execution. There's none of the thrill of the vast armies of Middle Earth, or the attention to the minutiae of Narnia that is really necessary in realizing a new world from scratch. Disney clearly hopes that this will bring them the rewards that 'Lord of the Rings' brought New Line Cinema and 'Harry Potter' is bringing to Warner Brothers. But 'The Lion, the Witch and the Wardrobe' lacks the emotional depth, epic range, creative inventiveness and dramatic urgency of the 'Rings' trilogy. Similarly, it has none of the humor, camaraderie, charisma or charm of 'Harry Potter'. 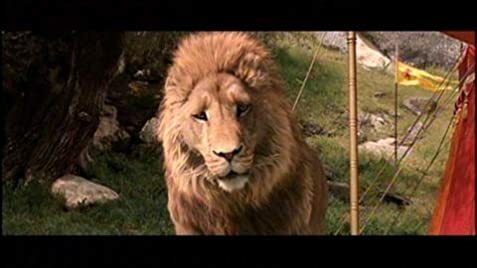 Judging from the audience that I saw it with, it will be very popular, and a sequel is very probable, but unless Narnia finds some heart and soul, the complete cycle seems unlikely. The motive power for the Pevensies' evacuation train was GWR 7802 Bradley Manor, one of the former Great Western Railway's Manor-class steam locomotives. Nine out of the thirty Manor-class locomotives built survive today. Mrs. Pevensie: Edmund! Get away from there! Peter! Mrs. Pevensie: What do you think you're doing? Peter! Quickly, the shelter! Now! In the beginning, when the German airplanes are bombing London and Edmund and Peter are in the garden in front of their house, you can see the shadows of the airplanes on the ground. This is not possible because it is night and there is no light above the airplanes that could cause those shadows. On the contrary, searchlights tried to discover those airplanes from below pointing into the sky. If there was a light above the airplanes strong enough to create shadows, they would be moving much faster. At the end of the credits there is a dedication: "For Isabelle and Sylvia"
Oh Johnny Oh, Johnny Oh!